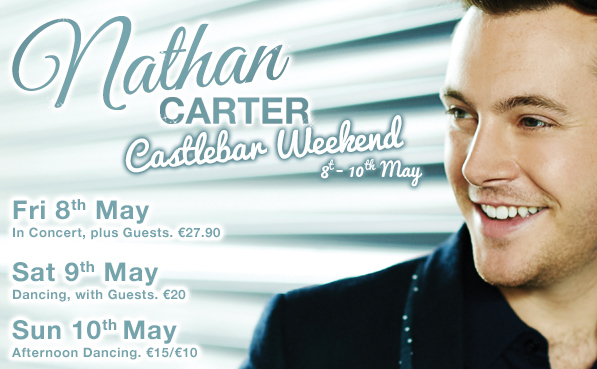 Country Music’s brightest star Nathan Carter returns to The Royal Theatre, Castlebar this weekend for a massive extravaganza of country music on 8th, 9th & 10th May 2015. The weekend kicks off on Friday 8th May, when Nathan and his band will light up the stage with a very special concert - featuring all the classic hits and songs that have made him a firm favourite with audiences. Special guests on the night will be Louise Morrissey & Brendan Quinn. There will also be dancing after the concert with Matt Leavy. On Saturday 9th May, things continue with our ‘Super Dance’'. Gerry Guthrie & Band kick things off from 9pm - 10.45pm, before the man himself Nathan Carter take to the stage from 11pm - 1pm. There will also be after show dancing with Stuart Moyles. That brings us onto the last day of the weekend, Sunday 10th May. There will be afternoon dancing kicking off at 3pm with Nathan Carter. Accommodation and entertainment packages are available for €199. This includes 2 nights B&B at the on site 4-star Harlequin Hotel, or 3-star TF Royal Hotel, and admission to all entertainment over the weekend. Please The Royal Box Office or TF Royal Hotel on 094 9023111 for more information. Or alternatively call the Harlequin Hotel on 094 9286200. Available In-Person: Royal Box Office and Ticketmaster outlets nationwide. Available Online: Click 'Buy Tickets' button, bottom right of the page.